Maybe some pictures after that Springfield mile? I always thought by now I'd have enough spare time hit things like that. Not yet. I rode my 66 today, first time in 3 or 4 years. Never anything wrong with it, but I started robbing parts off it. Felt good, runs strong. This is one I want to change back to ET now that I have some nice stuff stashed. Speaking of west coast Hornets, do yal have the same issue as I do...can't get the oil drain plug/filter all the way out as it hits the frame tube after it is unscrewed about 3/4". Have to unbolt the oil tank at its rear, but can't kick the bottom outward to unscrew the plug until the smaller 5/16" oil line is removed which is up against the forward frame tube. Even with the hose removed, the hose spigot in the tank is in the way up against the frame tube. A real design nightmare. I am going to use the "S" 37 degree hole on my 3 hole rotor. My manual must be older because it only shows the 2 hole rotor, with the "S" being 34 degrees for the 500, and the "R" for the 650 being 37 degrees. The 3 hole rotors have the "R" at 41 degrees. Here is a picture. It is getting close, but is not show stock. I had a west coast Hornet in 1969, and I seem to remember that most of these were modified within a month of being sold. I went East Coast pipes for 2 reasons. 1. I like the look better, and 2. My side stand lug is missing. I went with the B44 Front fender, because I had one, and it fit nice. I still have to paint the side covers, so they are not on yet. The heat shields have been installed since the picture. I plan to use it on the street. Hopefully that will quiet it down a bit. The foot pegs are a little funky, still working on that. Last edited by Roadwarrior; 07/14/17 11:26 pm. I know someone that has a set of used TT pipes for sale. They need work...scrapes and dents. The link to pages 1-64 will not work for me. 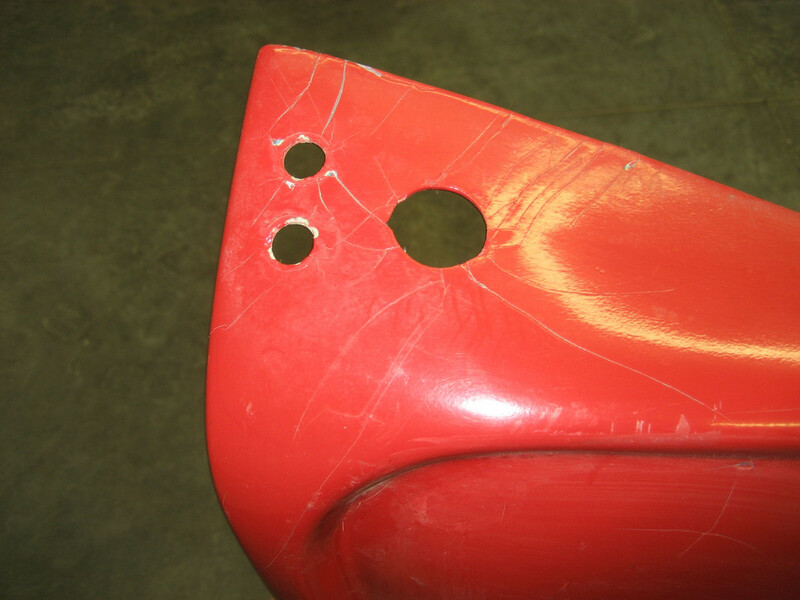 I would like to see Gary's post on restoring fiberglass side covers. I will contact John G. to reset the server that has all of it on it. It's his server. Then, the next problem to resolve is Photobuckets nixing of all of the images...everywhere. Once John resets the server so we have access to those first 64 pages, then I will have to go find the posts that you are interested in, and reload those particular images to a different image Hosting site and reload those image links to that particular thread page. I will do that. John has reset the server, so the first 64 pages link in the first post on this thread now work. 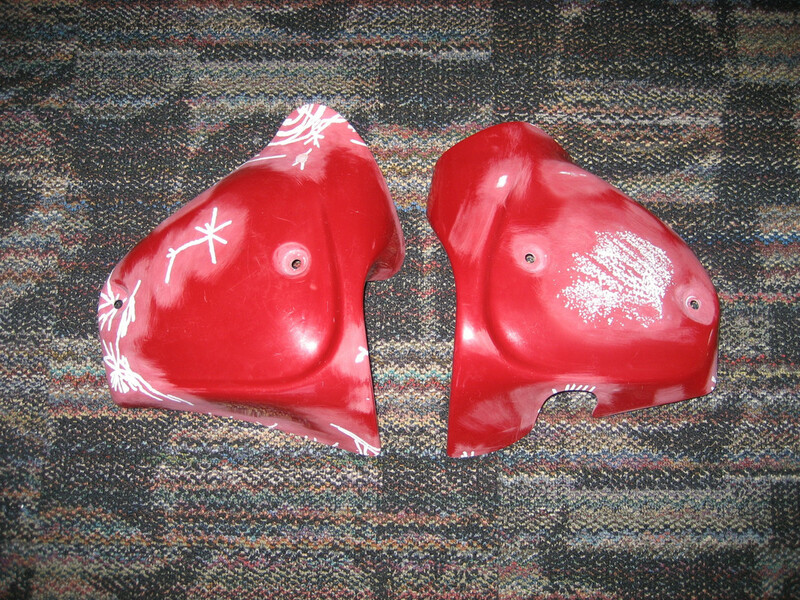 I will now attempt to find the posts on the subject of restoring the fiberglass covers and replace the associated images. Thank you, Gary. They are on page 24, in case you have not yet found them. 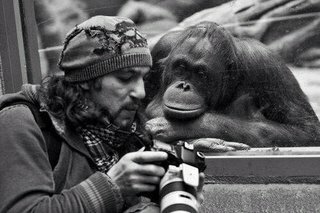 I am grateful for help. I was not able to re-create the images on the original first 64 pages. It doesn't let me edit. What is there, or not there, is locked in stone. So PhotoBucket has really f...ked us again. So, what I have done is re-created here the whole post on that original page 24, plugging in the original images. Any one that has a desire to have the same applied to any of the other posts I made in those original first 64 pages, I will do it upon request. 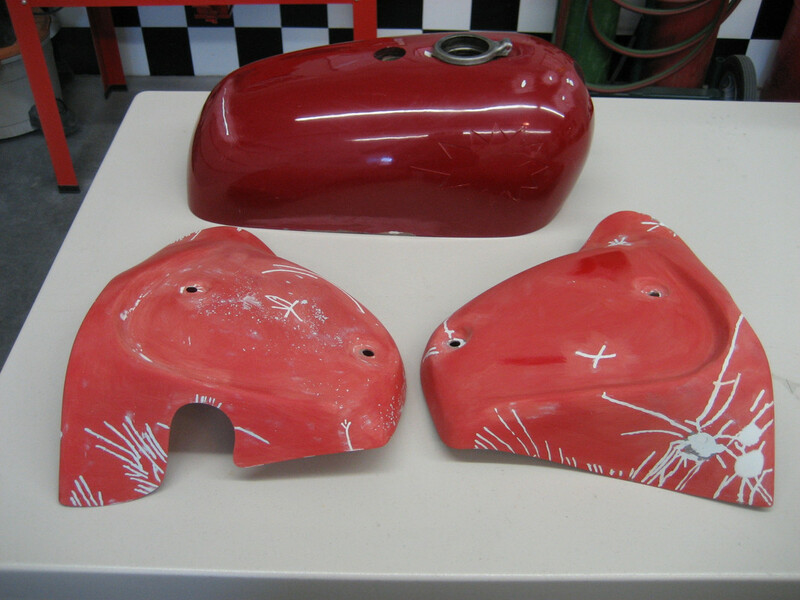 Does your Hornet, or for that matter any model, fiberglass side covers look like this (note the five layers of paint added over the last 44 years)? OR THIS? And look at the stress cracks in the gel coat that will always continue thru every layer of re-finishing if not repaired first. And a real brilliant idea by someone for the location of the switches and ignition switch. And you want them to look like this? It can be done with work. Here is what has been done to get them ready for primer and paint. After stripping all layers of paint of via sanding, stripping agent, or medium blasting, The stress cracks are ground out thru the gel coat to the underlying glass. Be careful how far you go as the glass is thin in places. The glass is not glass cloth mat but typically shot into the mold from a course chopper gun, so the covers have various thicknesses in places. The ground out areas are then filled with an appropriate 2-part glazing putty. Some repairs require glass work. 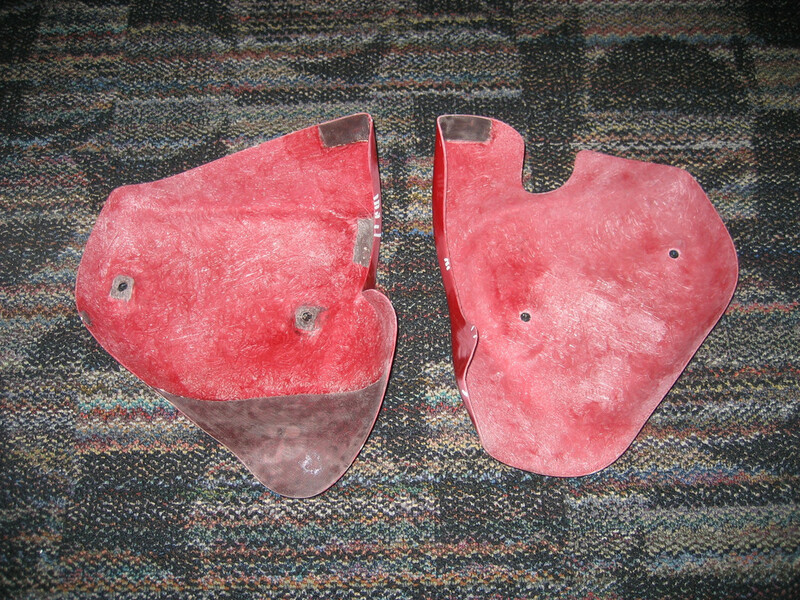 With the covers below, mounting holes needed to be rebuilt, a broken cover (in the typical front spot) needed repair, and the lower portion of the cover was too thin to hold up well in the future. Also, the top corner was reinforced on each where it is in constant contact with the frame (even with the buffer in place). 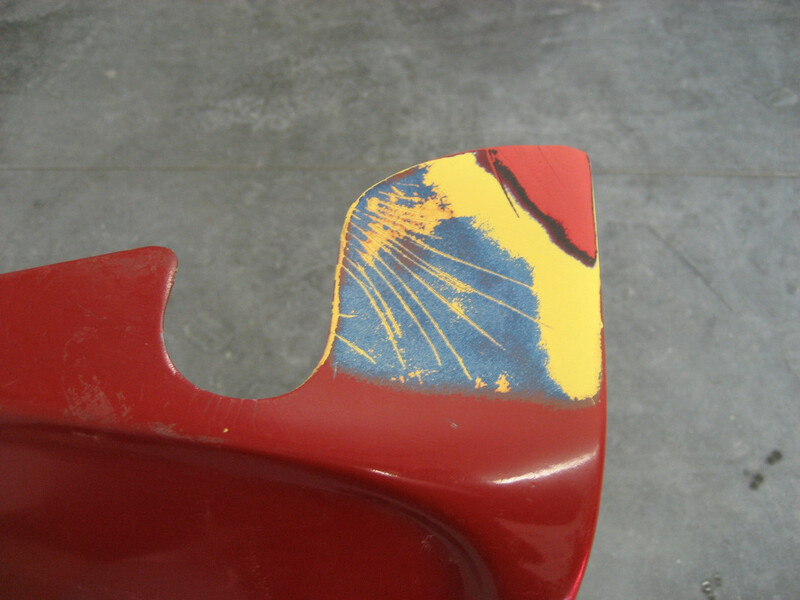 It is usually a source of stress cracks in a new finish. After restoration, hopefully the covers will hold up well for the next several years...until the next guy decides to shortcut the re-finish process with an old can of spray paint from his garage. Kinda feels like the end of an era.......or the end of something. anyway. We all used photobucket and recommended it to others. This big, long thread was a goldmine for anyone working on mid-sixties A65s. Kinda happened just as I am moving on to flathead Fords as my chief obsession. Gary: hope you are doing well, and many thanks for all the time and effort you put into this deal. Yes Thanks for the extra effort Gary !! Thanks fellas. I also have switched gears a little bit. Although vintage bikes are still very prominent here, the current project in this shop is a 1942 WWII carbon arc 60" searchlight. A really big headlight, or as my friends call it, my big flashlight. Anyway, keeping on the subject of the of the Hornets and the Wasp, the "Three Tenors" are at a museum up in the northern part of the state for four months this summer. So, the shop looks like it needs more bikes in it. You can catch him at his Museum Of Drag Racing in Ocala Fl. Got to the point of installing the damper assembly, and I need to ask; the connection to the frame for the steering limit plate, is it just supposed to be a flat bar? And isn't the plate supposed to go above the flat bar? My frame seems to have two "fingers" sticking up, 90 degrees from the plane of the bar.... These will not let me mount the plate above the bar. Sounds like you've got the wrong damper plate. The flat one (same as A10) only fits frames up to 1965. The later one is turned up 90 degrees to match the "fingers"
None of them are flat. All have bends and curves in them. The correct one has a bolt welded at the back of it. The best view of the proper one is in the '68 Spares manual, page 48, item 30, part number 68-5185 (anchor plate). The '66/'67 Spares manual has the old style shown. And the Friction Washer goes on top of the anchor plate along with the special Spring Washer. Is that "special spring washer" the 'star' shaped one? Or something I'm still missing? Last edited by Rickman; 08/12/17 2:37 am. 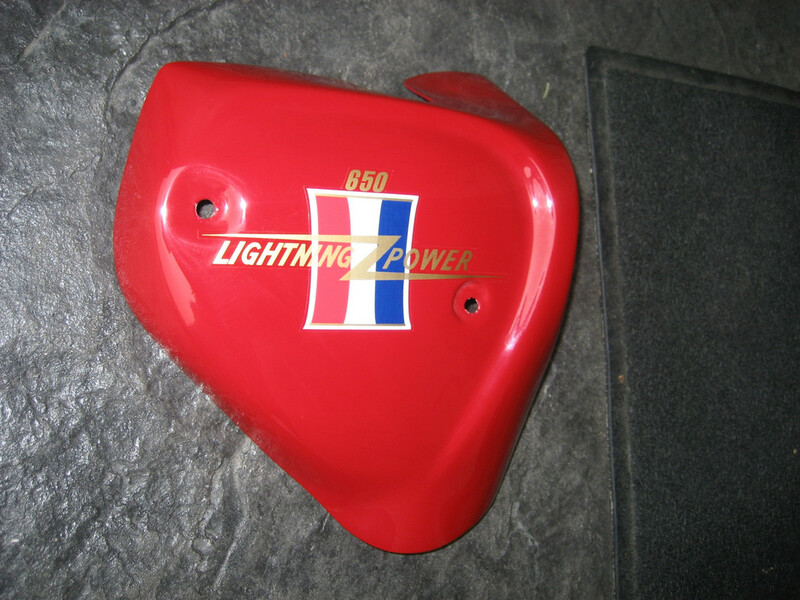 The '69 anchor plate is the same as the '68. You are still missing something. I hadn't picked up on post #702485, the left hand side panel on my 1967 West Coast Spitfire has these holes - I had thought that a previous owner had just been creative – was the switches move a common modification or just something that Hornet users did to protect switches from off-road damage? Not a common modification that I know of. Just something a particular owner decided to do back in the day. The big hole looks to have been for the ignition switch. The changes are not neccessarily done only on Hornets. It could have easily been done to a side cover on any year or model machine. Dang. The right side. I know someone that has a single pipe, but it is the left side. Figures. Thanks for the info on the two machines. Unfortunately, neither bike is very original. 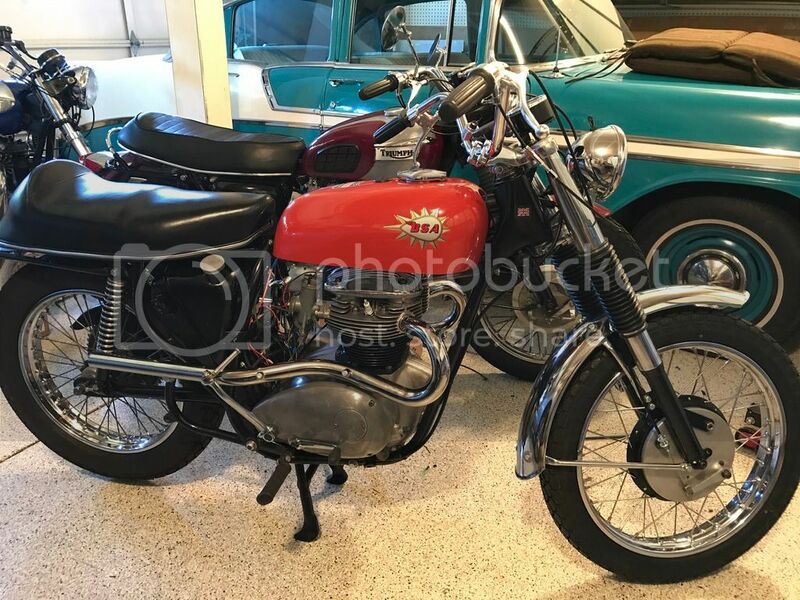 Neither one has original factory BSA TT pipes, and both rear fenders have been bobbed. Those two items are very hard to source. The eBay bike looks to have Triumph style TT pipes on it. Last edited by Gary E; 05/21/18 9:12 pm. Been reading a lot on this thread. Very helpful info. I just fired up my 65 Hornet after sitting for a few years and had to go thru the dreaded Leaking stock tank. It was a perfect tank a few years ago and stupid me, i left a small amount of gas in it over the years. Any way, I have a steel India tank on it now, even thou it has the 66 and later style gas cap, I will run it for the time being. My question is. I have the stock AMAL Monoblocs on it, but it runs some what erratic. I put new slides in it just to try it out, but i am not happy. Has any one tried Lunds rebuilding their original carbs? I see i can by new AMAL's, but???????????????? Just trying to decide which way to go. Any comments would be appreciated. Last edited by Mark M.; 09/20/18 1:20 am.